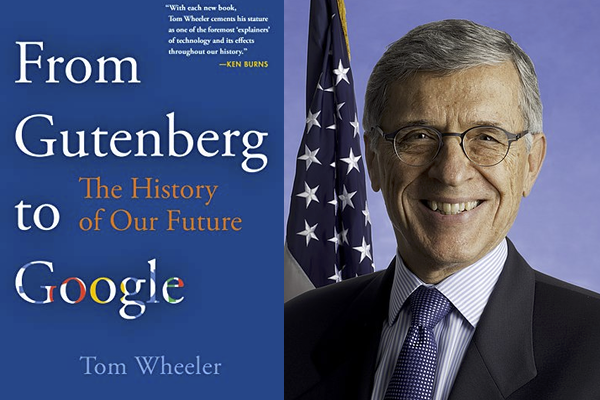 Tom Wheeler is author of From Gutenberg to Google: The History of Our Future (Brookings, February 2019) and was the 31st Chairman of the Federal Communications Commission from 2013 to 2017 under President Barack Obama. New technology ripping up and reshaping the economy and individual lives. Personal privacy sacrificed. Local businesses chased out of business by remote technology-wielding companies. Monopolies ascendant. This may sound like a description of today, but it is also a portrait of America about 150-years-ago during the last great technology-driven revolution. We proceed at our own peril if we don’t understand the similarities of circumstances and solutions between today and that history. Like today, the new tech companies of the late 19th century were rich and powerful. Like today, the companies took advantage of the new circumstances technology had created to make their own rules. Ultimately, however, the American people had enough and their representatives in government created rules responsive to the new reality. Those rules – replacing corporate good with common good – went on to provide the stability and security underpinning unparalleled growth and wellbeing. The common denominator we today share with 150 years ago is the emergence of a new network that upends everything it touches. For us it is the internet; a century and a half ago it was the steam railroad. We marvel at the changes imposed by the internet, but they pale in comparison to how the railroad – the first high-speed network – restructured the human experience by vanquishing distance. From the beginning of time, geography had controlled destiny: lives were lived in proximity to where they began; economic activity was tied to what came from the land; the family unit was also an economic unit. The railroad destroyed these traditions. Expanding at an unprecedented pace to move people and products at unimagined velocity, the railroad enabled industrialization, pulling masses of workers from the farms into urban centers for the mass production of products that were then redistributed back out to an interconnected mass market. Operating typically as local monopolies, railroad companies were free to charge whatever the market would bear. Farmers especially found their economic well-being controlled by the railroad monopolies. After a decades long fight for regulation of the railroads, in 1905 Congress gave the new Interstate Commerce Commission (ICC) – the first federal regulatory agency – the power to determine whether rates were just and reasonable and to require railroads to haul all freight on a nondiscriminatory basis. On the heels of the railroad came the first electronic network: the telegraph. If the locomotive drove the death of distance, sparks from the telegraph key were the end of time in the distribution of information. The lightning speed of telegraph messages created national-scope activities: a national media, national financial markets, national weather forecasting, and the creation of large managed-from-afar corporations. The telegraph was also typically a local monopoly. Wary of a bottleneck to the free flow of information, Congress included in the Pacific Telegraph Act of 1860 a requirement that message traffic be carried without discrimination in the order it was received. Preventing monopolistic bottlenecks through non-discriminatory network access on just and reasonable terms is a 150-year-old principle that remains fresh today. It is as applicable to the zeroes and ones of digital code as it was to the steam and sparks of 19thcentury networks. Beyond the behavior of networks, the principles developed to oversee the behavior of those who use the networks remain relevant today as well. Like internet giants such as Google and Facebook, the 19th century entrepreneurs that took advantage of the new technologies grew quickly, often at the expense of local businesses. When Gustavus Swift developed the refrigerated railroad car in 1878, for instance, his company did to local butchers what the internet companies would do to the local advertising business over a century later: provide an important new service that also had the effect of destroying a cornerstone of the local economy. For Swift it was slaughtering at scale. For Facebook and Google it was targeting information at scale. Like the mid-19thcentury, the new networks have been harnessed to centralize economic activity in big corporations. Montgomery Ward and Richard Sears were the Amazon of the era, taking business from local merchants via mail order. Shortly after the turn of the century, Theodore Vail consolidated both telegraph and telephone networks to squeeze out local competitors. John D. Rockefeller leveraged the volume his oil business did with the railroads to crush small competitors. Congress acted multiple times – the Sherman Act in 1890 and in 1914 the Clayton Act and Federal Trade Commission Act – to harness the abuses of market-destroying monopolies. The principles that reigned in Rockefeller and others remain relevant to today’s digital Rockefellers. The effects of today’s new technologies reprise the historical experience. The question remains, however, as to who will make the rules for the digital age? Thus far, the people’s representatives have largely been unwilling to follow history’s precedent to protect consumers and competition in the new environment. Because the capabilities of digital technology are new, there are few rules protecting consumers and competition from its impact. Over a century ago when the rules governing agrarian mercantilism proved insufficient for the industrial era, new policies were developed to reflect the new realities. For the last few decades we have relied on extrapolating those industrial rules to our new internet circumstances with little success. We now need specific rules for the internet era. The principles underpinning the industrial era rules remain valid today, they simply need updating to reflect the capabilities of the new technology. New guardrails are needed to protect against the natural tendency of institutions and individuals to maximize for their own welfare, rather than the welfare of consumers or the competitive market.